The art of fall layering is no easy trick to master. There are so many different ways to layer, but I know that I always want to feel comfortable, chic, and warm when it gets cooler out. You probably have your go-to fall layering styles down already: sweater, jacket, scarf, repeat. Or the always-cute button down under sweater with jeans and booties. I love to layer and love those layering styles, but I found myself wanting to discover new ways to put a spin on my layering. Naturally, I took to digging around Pinterest and I wanted to share 5 ways to freshen up your fall layering styles this season! Throwing this cropped sweater over my white button down tunic was just the right trick to recreate a look I’d been loving online. This is definitely something I’ll wear to the office on a regular basis. You could pop the cropped sweater over a ruffle hem dress too and wear it with your favorite OTK boots! You know when you walk out the door and get in your car you need your coat but when you get to the restaurant for dinner you just need a light jacket layer underneath? The two outfit pics I’m sharing above are two great ways to layer your layers, ha! It’s all in the art of draping. You can really up your fall layering game by draping your wool coat or your leather jacket over lighter layers like a cardigan or a suede moto jacket. This way you’re getting the added warmth you need without bothering with stuffing chunky sleeves into your coat sleeve – the worst! Last week I wore a pullover tunic to work, but it’s a v-neck and I didn’t want it too low cut for the office. I threw on a tee underneath and it was the perfect (and coziest) fix. Your favorite tee can really be the base of most of your fall layering. When temps really drop, it’ll be a nice added layer for warmth. But for right now when it’s actually fall in the mornings and then spring/summer by noon, it’s a great base layer that you can wear by itself once the temps go up by the end of the day. While layering with a crewneck sweater is usually the easiest, it doesn’t mean that you can’t experiment with a cowl neck, v-neck, or turtleneck sweater for your layers. 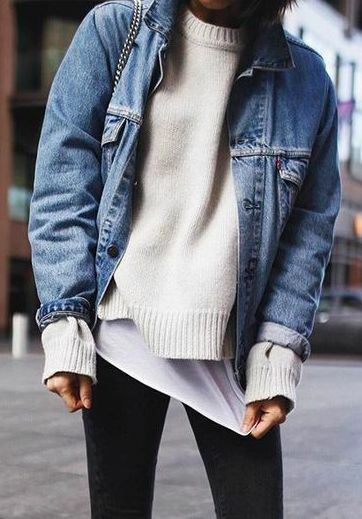 Like in the outfit pic above, you can take a more cowl neck sweater and throw it over a collared chambray button down for another updated version of this layering style. This is a great way to get more out of your pullovers with different necklines and to wear them more than one way. If you live in Texas, do you ever really put away your lighter weight, “summery” layers? Uh, NO. Fall transitional lasts for a solid 3 months before it’s really time for purely coats and sweaters! That’s why I had to include this fall outfit inspo with a cami. Pop a lace cami over a thin turtleneck layer for an easy layered look that doesn’t involve any heavy coats or jackets. With this kind of layering, it’s best to stick with neutrals in the same color family or classic pairings like black and white! There’s lots more outfit inspo and tips/tricks where this came from! Click here to head to my Pinterest and follow along for help with all of your styling and inspiration needs.